You just can’t go wrong with a steaming bowl of soup!! It doesn’t matter the season and I’ll happily drink soup but especially when the leaves begin to change colour it really is soup season. 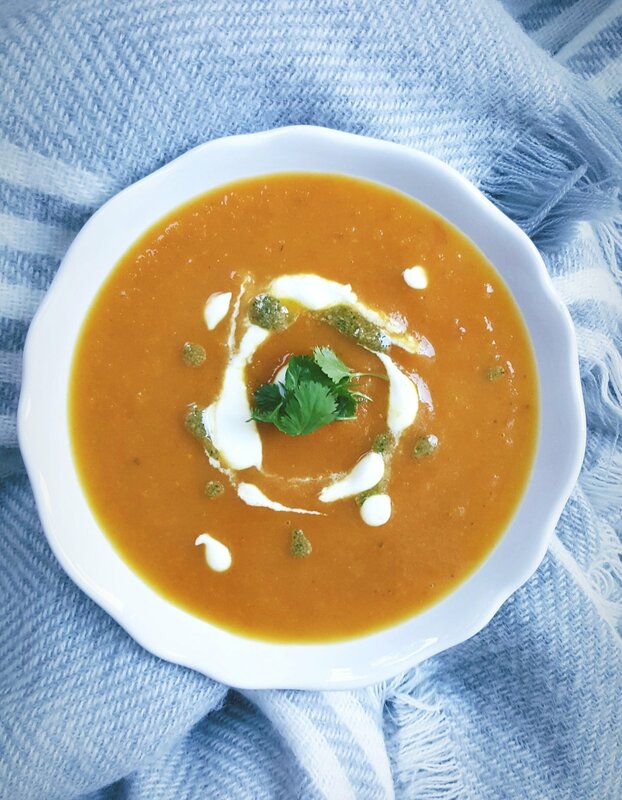 This carrot soup combines the beautiful natural flavours and goodness of coriander and ginger that really gives you a warm glow from the inside out. Ginger is such a powerful ingredient and is so flavoursome. Grate it into any dressing for an instant flavour infusion, finely chop into stir-fries or add to curries. Anyone else find that you generally only need a small amount of fresh ginger compared to the quantity you have bought? I usually chop the ginger into smaller portions and freeze in a resealable bag. Then, simply remove from the freezer and grate frozen into whatever recipe you are creating. If you don’t have coconut milk simply double the quantity of vegetable stock. Add the onions and garlic and saute until softened. Stir through the ginger and coriander until fragrant. Add the carrots and cook for 5 minutes whilst you prepare the stock. Combine the stock and coconut milk with the vegetables. Bring the saucepan to a boil, cover and reduce to a simmer. Cook for a further 20 minutes or until the carrots are soft through. Blend to your desired consistency and serve with a sprinkle of mixed seeds on top. If freezing: divide into resealable containers, allow to fully cool and place in the freezer.